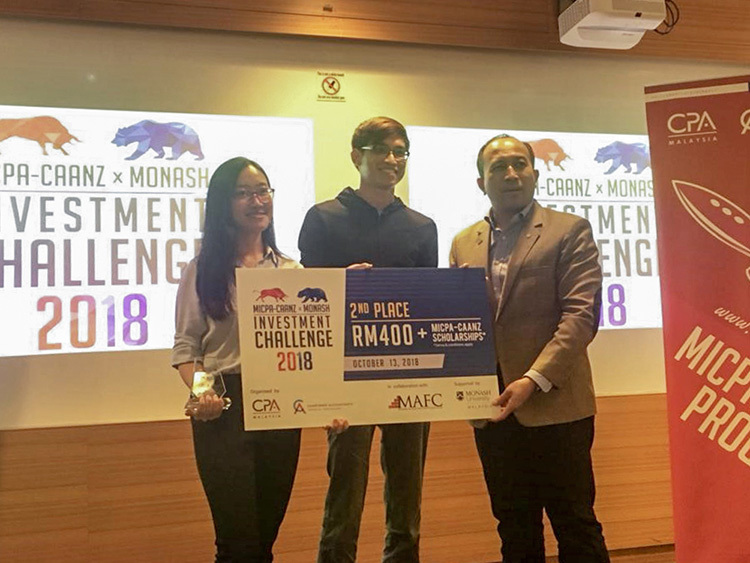 Miri – 23 October 2018 – A student team comprising Lam San San and Clifford Guok Khor Huat from Curtin University Malaysia (Curtin Malaysia) emerged runner-up in the recent MICPA-CAANZ x Monash Investment Challenge 2018. 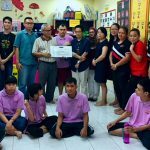 The duo comprised one of two teams representing the university in the competition, the other team consisting of Mohamad Arif Zaim Bin Badrul Hisham and Amy Josephine Khiu Sing Yii. Leading the teams was finance and banking lecturer Dr. Oladokun Nafiu Olaniyi, who along with accounting lecturer Chan Kwok Mow, selected the four students for the competition. Held at the campus of Monash University Malaysia in Bandar Sunway, Selangor, the MICPA-CAANZ x Monash Investment Challenge is an annual competition jointly organised by the Malaysian Institute of Certified Public Accountants (MICPA) and Monash University Malaysia to expose accounting students to finance and investment in securities. 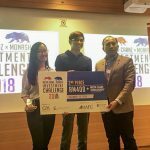 The competition, which started seven years ago, pits teams from universities across Malaysia against each other in a competition involving trading in three main securities – stock, bond and Forex. At the end of the competition, the top four teams accumulating the highest profits are required to give presentations on the strategies they employed in their trading processes. 24 teams took part in this year’s competition in which Taylor’s University came in first, followed by Curtin Malaysia, Sunway University and Universiti Putra Malaysia. The top four teams received cash prizes while the top two teams received, in addition, MICPA-CAANZ Programme Scholarships for two out of the five modules of the MICPA-CAANZ Programme. Guok said he was pleasantly surprised with his team’s win. He attributed the team’s success to good teamwork and credited Lam, an international student from Vietnam, for being the staying force with her calm demeanour and sharp mind throughout the competition. Both expressed their joy at receiving the scholarships for the MICPA-CAANZ Programme, which they will commence upon graduation. In congratulating the two teams on their strong showing in the competition, Chan, who is chairperson for industry engagement at Curtin Malaysia’s Faculty of Business, said they had done their university exceptionally proud. He thanked MICPA and Monash University Malaysia for organising the annual event providing opportunities for accounting undergraduates across the country to experience trading in the financial markets. 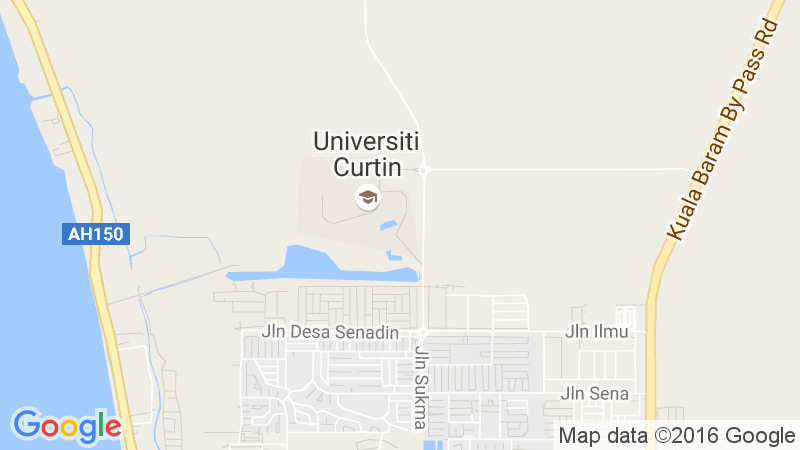 “Curtin Malaysia is equally committed to engaging and connecting with industry to enrich the student learning experience in work integrated learning through collaborative alliances with corporate and professional bodies to prepare our students for the challenges of a skills workforce in transformation,” he said. Meanwhile, Acting Dean of the Faculty of Business Associate Professor Pauline Ho said Curtin Malaysia is committed to providing quality courses that combine business knowledge and professional skill development to ensure graduates are highly trained and industry ready for rewarding careers all over the world. Complementing its undergraduate single and double majors in a number of disciplines including accounting, finance, entrepreneurship, banking, marketing, management and public relations, and postgraduate degrees by coursework and research offerings, will be a Bachelor of Commerce in Management and Human Resource Management, Master of International Business, and Master of Commerce in Marketing in the coming year. 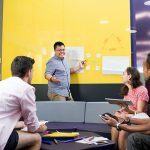 In terms of new teaching facilities and enhancing its leadership in innovative digital learning, the Faculty of Business will see the opening of its Bloomberg Trading Room fashioned on a similar facility at Curtin’s main campus in Perth providing simulation of a real life trading floor environment for business students. For more on Curtin Malaysia, visit its website (www.curtin.edu.my), Facebook page (CurtinMalaysia), Twitter profile (curtinmalaysia), Google+ page (Curtin Malaysia), Instagram (curtinmalaysia) or YouTube channel (Curtin Malaysia).